Glen Baxter Image Gallery : Glen Baxter, nicknamed "Colonel Baxter," is an English cartoonist, noted for his surrealist, absurdist drawings. The Perry Bible Fellowship : The Perry Bible Fellowship is drawn by Nicholas Gurewitch. François Schuiten made the announcement poster for the exhibition Machines à dessiner in Musée des Arts et Métiers in 2016 AD. François was filmed during creation process by Vladimir Peeters. From this footage a movie was produced by Musée des Arts et Métiers and Les Piérides SPRL. The conventional way of experiencing music is usually through existing technologies such as the ipod or the radio. However, this style of experiencing music takes place in a given form; is static and as a result leaves us dissatisfied. To really enjoy music, we need to find music through sounds around us. We need to stop being tied down with new gadgets that provide the music for us, but to search for music ourselves. A series of ideas like these lead me to create this device. This creation's main concept is to record sounds from daily life. It is the concept of ‘collecting sounds in a bottle’. You choose the sounds collected in the bottle. Using everyday sounds as a musical component establishes a new understanding of the sounds we listen to everyday. By collecting your own sampling of sounds, you encounter a unique piece of music that can be experienced only once. This device will bring a smile to anyone, as many will be able to experience the charm of music, leading them to turn music into something they love and adore. Visual Futurist Syd Mead ("Blade Runner," "Aliens," "Tron") reflects upon the nature of creativity and how it drives the future. Every New York Times newspaper front page since 1852 : The news is breaking. This video is about exploring the spatial qualities of RFID, visualised through an RFID probe, long exposure photography and animation. It features Timo Arnall of the Touch project and Jack Schulze of BERG. The problem and opportunity of invisibility RFID is still badly understood as an interactive technology. Many aspects of RFID interaction are fundamentally invisible; as users we experience two objects communicating through the ‘magic’ of radio waves. This invisibility is also key to the controversial aspects of RFID technology; once RFID antennas are hidden inside products or in environments, they can be invoked or initiated without explicit knowledge or permission. (See here for more on the invisibility of radio.) But invisibility also offers opportunities: the lack of touch is an enormous usability and efficiency leap for many systems we interact with everyday (hence the success of Oyster, Suica and Octopus cards). But there is also the ‘magic’ of nearness one of the most compelling experiential aspects of RFID. As designers we took this invisibility as a challenge. We needed to know more about the way that RFID technology inhabits space so that we could better understand the kinds of interactions that can be built with it and the ways it can be used effectively and playfully inside physical products. This movie was shot using a rotating camera mount on the corner of 22nd and Bryant in San Francisco. Ideas and practices for regularly gathering sources of inspiration, eliminating blocks to more easily access creative states, prolong them, and leverage their power to develop and execute great work. Slavoj Zizek - Catastrophic But Not Serious : We are aware of the looming (ecological, social) catastrophes, but we somehow don’t take them seriously. What ideology sustains such an attitude? Bret Victor invents tools that enable people to understand and create. He has designed experimental UI concepts at Apple, interactive data graphics for Al Gore, and musical instruments at Alesis. After his older brother Victor died in Berlin, Cristian (17) decides to make a documentary about his family and his brother's best friends. How do they feel? How do they deal with the death of someone so close to them? Inspired by the home videos I made since the late eighties, in this, my first feature film and/or mockumentary, I 'kill' myself to interview my family and my best friends from Chile and Germany, exploring the acting skills of non actors and the line between fiction and documentary. 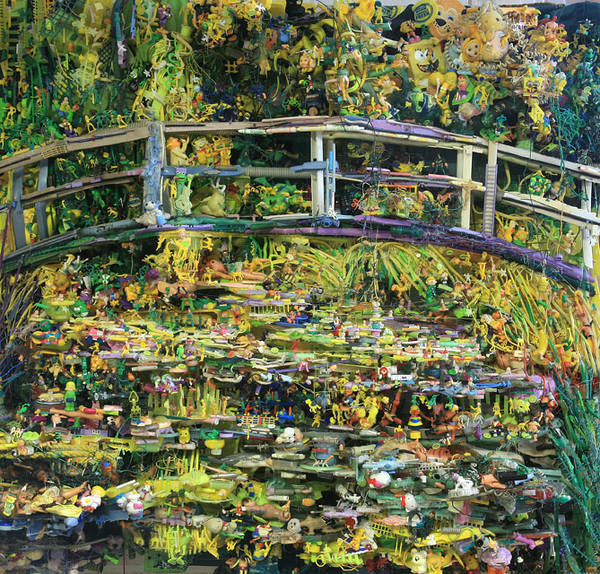 Tom Deininger is an assemblage artist who arranges bewilderingly large collections of odd plastic tchotchkes into gorgeous pieces, including this Monet-like masterpiece. In this recorded presentation from FITC Toronto 2011, Robert discusses these invisible forces at greater length and demonstrates a few implementations and unexpected uses. Appropriated digital video - 2009 || concept by Billy Rennekamp. A winner of the 2010 Vimeo Awards! Nadia Myre : Myre’s practice is defined by her masterful ability to move among multiple mediums to address complex issues of history and experience.